Architects design for Human Beings. Design impacts human rights. Whether it is education, social interaction, employment, recreation, legal or medical rights, they’re all impacted by built spaces. It is therefore imperative that an architect takes all this into consideration while designing any building. EKansh Trust is an NGO that works for the empowerment of People with Disabilities. It is empanelled under the Sugamya Bharat Abhiyan by the Government of India for access audits of Government Buildings based on the expertise of the Founder and Managing Trustee, Anita Narayan. 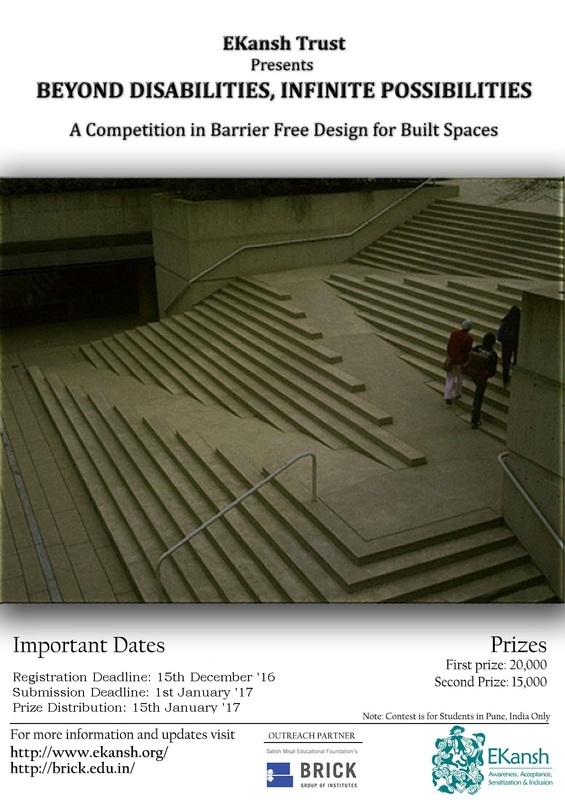 This contest is the second one to be organized for Students of Architecture and Civil Engineering in Colleges in Pune by EKansh Trust. The first one [in India] was held in 2009 by the NGO and very well supported and received. Brick School of Architecture is a leading institute in Pune. Smt. Madhuri Tai Misal is the Chairman of Satish Misal Educational Foundation’s BRICK Group of Institutes and Mrs. Pooja Misal is the Director of the institute. They envision providing quality education to design professionals with pedagogical strategies, innovation, and creativity while connecting theory and practical by engaging professionals, educators, and practitioners. They believe in imparting sound knowledge of sustainable design to their students. Through this contest EKansh Trust and Brick School of Architecture seek to sensitize budding designers to be more inclusive in their outlook and design. While planning from the start is easy, retrofitting for accessibility is both expensive and difficult to do keeping aesthetics and the old structures in mind. Direct queries to:﻿ ﻿﻿info@ekansh.org ﻿﻿﻿or shardulijoshi@brick.edu.in﻿. This is a vast area of picturesque gardens surrounding a temple in the center of Pune. The central 18th-century temple is the park’s highlight, attracting visitors and devotees year-round. The temple’s pretty moat and spacious fields make it an ideal spot to take the whole family for a picnic on a sunny day. The entire complex, named after a type of crane bird, is spread across 25 acres (10 hectares) of land. Please visit Saras Baug with the goal of the competition in mind and recommend changes. The challenge is to redesign the park to be accessible to People with Disabilities. Logos of hosts [EKansh and Brick] have to be added to sheets. Design proposal should consist of site plan, detailed plans, sections, elevations and views to appropriate and legible scale. Soft copy of the sheets in PDF format on DVD with name of participants on the cover. Please ensure that the file are of email appropriate size. Sheets and DVD to be submitted at the EKansh Trust office only. Please ensure that PDF files are of email appropriate size. Bring your fee receipt with you during submission. Study the Accessible India Campaign handbook [available online] to understand the idea better. Venue for Prize Distribution: Sumant Moolgaokar Auditorium MCCIA, S B Road. All students, professors and professionals involved in civil enginneering, architecture and design are welcome. Abhishek Ray is a practising architect and designer based out of Mumbai. He has been a proponent of Universal Design and Accessibility in his realm of work which enables inclusion for people with special needs in the Built Environment. In his 14 years of being a design practitioner Abhishek has designed and consulted on projects in India and abroad on developing innovative methodologies for accessibility. He has been the recipient of the prestigious Ashoka Lemelson fellowship in 2006 which honours and supports work done by individuals in the field of social entrepreneurship. Abhishek is the principal architect of Matrika Design Collaborative, a multi-disciplinary design firm which renders solutions in the socio-cultural realms in India and has worked in developing museums and schools in recent past. His work in the design sphere resonates his approach in research, participatory design and inclusion for developing the most appropriate solutions.Abhishek is currently creating an international collective of design professionals with his partners from Jakarta, Mumbai and Buenos Aires to work on socially relevant development projects in India, South Asia and South America. 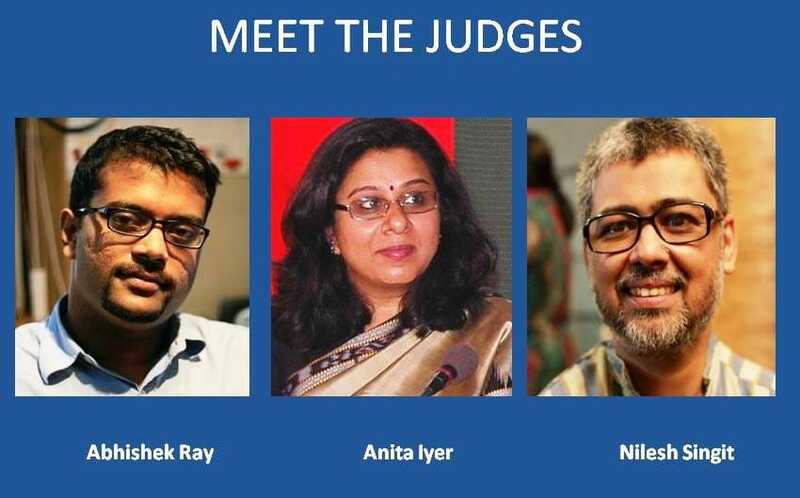 Anita Iyer Narayan is the initiator of the contest under the banner of her NGO, EKansh Trust. One of its many focuses is Barrier Free, Inclusive Built Spaces for People with Different needs. The first such contest in India was held by EKansh in 2009. Anita is a qualified and experienced Access Auditor, having attended a course in Inclusive Environments and Access Auditing in London, and audited several Corporate and Public buildings. EKansh Trust is empanelled by the Government of India for access audits of Government buildings. Anita has conducted and organized workshops on the subject of inclusion all over the country for professionals, professors and students of architecture and other streams as well. She has mentored several students of Architecture and guided them in the principles of Inclusive design. She has conducted audits of the Cochin Shipyard, Ch.Shivaji International Airport terminals, Corporate buildings and offices, gardens, etc. She is the winner of the NCPEDP – Helen Keller Award for promotion of employment for People with Disabilities. She has also won two Super Achiever Awards from World Women Leadership Congress and the Inorbit Award for Leadership. Nilesh Singit is a Research and Advocacy Officer at the Centre for Disability Studies NALSAR University of Law. He has a Masters degree in English from University of Bombay, and has completed a postgraduate degree course in Human Rights. He has over 18 years experience in the field of disability with a special focus on access audits, accessibility and inclusive design, disability diversity/equality/rights training and research into disability issues. He has been instrumental in filing several public interest actions in the Mumbai High Court and Supreme Court.